Orthotics, not to be confused with prosthetics, which deals with the manufacture of missing or defective limbs, is the field of medicine concerned with the creation of custom-made external supports such as braces and splints. These external supports, otherwise known as orthoses, help to improve overall life quality through supporting, preventing and correcting issues within the neuromuscular and skeletal system. A clinician who specialises in the prescription, design, production and management of orthoses is called an orthotist. As orthotics is concerned with the entire body, the role of an orthotist is extremely varied. At Technology in Motion, our dedicated team of experienced orthotists specialise in skull, face, knee and foot orthoses. Plagiocephaly and its variants (brachycephaly, craniosynostosis and scaphocephaly) affect half of all babies under the age of one to some extent. This common syndrome is characterised by one or a combination of the following symptoms: flattening to the back or either side of the skull and, in more severe cases, ear, eye and jaw misalignment. When left untreated, the once ‘normal’, round and malleable skull of an infant can harden into a flat, parallelogram shape, potentially causing long-term effects such as the inability to wear protective headwear. To treat moderate to severe levels of plagiocephaly, we typically prescribe the TiMband (an effective cranial remoulding helmet). This helmet is worn for 3-6 months and provides infants with a pain-free solution to their skull deformity. The knee is an integral and complex part of the body, responsible for the majority of our lower body movements. As the knee carries the entire weight of the body when stood upright, pressure-related injuries can, and often do, occur. To help improve mobility and prevent further injury, we control the knee using a supportive knee brace. Knee-bracing is a practical solution for many. However, it is particularly popular among those suffering from osteoarthritis, ACL and sports injuries. Designed to protect the knee which has had a ligament injury such as an ACL ligament injury. A ligament knee brace such as the CTi, DonJoy or Medi knee brace will help prevent injuries from high-energy activities such as motocross or skiing. These knee braces are specifically designed to protect users from ligament, patella and meniscus injuries. As we age, or if we’ve had a previous knee injury or are overweight, the knee joint can start to develop arthritis. This often happens only in one side of the knee joint and if this is the case, an unloading knee brace can help by taking the load from the affected side and redistributing it to the non-affected part of the knee. This helps to extend the life of your own knee joint and delays the need for early knee replacement surgery. This particular type of brace reduces the pressure on the medial or lateral compartments within the knee to relieve pain and reduce the amount of wear in the joint. If you have a knee injury or early knee arthritic pain and would like to find out more about orthotic treatment, read our post on the different types of knee injury and the best braces to support them. Sports injuries are just that, accidents that happen on the pitch and many players will no doubt experience a broken facial bone at some point in their sport. Rather than sit on the side lines and put your active life on hold a protective sports face mask will provide protection to the surgical repair and allow early and safe return to your sport. Used by sporting legends such as Bury FC’s Martin Ogden and sports enthusiasts alike, sports face masks provide custom protection for a broken cheek, brow or nose. Ready-made ‘old school’ sports face protection usually restricted the wearer’s peripheral vision, compromising their performance and putting them at risk for further injury. 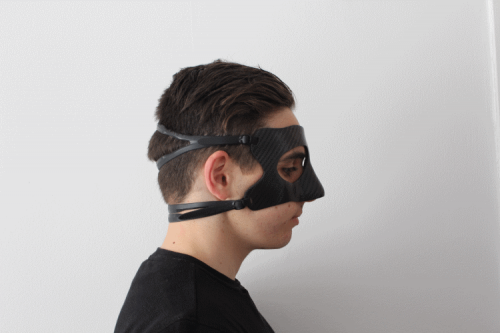 Now, thanks to accurate 3D scanning technology, an orthotist is able to create a custom carbon fibre mask which perfectly fits the unique contours of your face, relieving pressure from the broken area and translating it to the surrounding surfaces. According to the Pharmacy Magazine, ‘90 percent of men and women experience some sort of foot problem, with 20 per cent saying they suffer with foot pain often or constantly’. Generally, foot pain is caused by incorrect footwear or foot alignment. When left untreated, foot pain can develop into a series of injuries ranging from Achilles Tendonitis to Patella Tendinopathy. Do You Need to See an Orthotist? Many of us suffer from immobilising, limiting or paralysing injuries. If you’re tired of living in discomfort and pain, get a new lease of life by investing in an orthotic device. Whether you come to us directly, or are referred to one of our clinics by a physician, our experienced team of orthotists will assess your condition and prescribe the right orthoses for you. To book your appointment, contact us today.